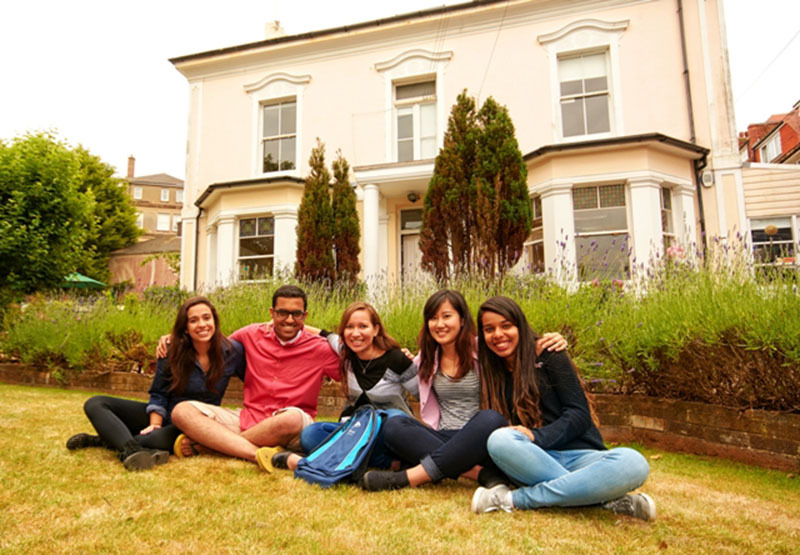 Learn English in Eastbourne at our partner school, St. Giles. Located in a elegant building with a large garden, St. Giles Eastbourne is just 100 meters away from the area’s best beaches, and 10 minutes away from Eastbourne’s town centre. This residence is not available for students under 18 years of age. A double room can only be booked by two people traveling together. For all the students staying on Dec. 25 and 26, they must pay a surcharge of € 37 for full board expenses. Special dietary requirements supplement: € 25 per week. Please indicate on the booking form if you wish to book this option. In case of delay there is a surcharge of € 31 per hour (to be paid whilst there). Please fill out on the bookingform on which airport you will arrive. Students aged 16/17 must obligatory book our airport transfer service on arrival and departure. All the minors also have to carry a Parental Travel Consent Form provided by StudyTravel with the invoice-confirmation. Assisted check-in (if required by airline) for students under 16: € 48. Prices are for single journeys. Price of a transfer is 100% higher for Dec 25 and 50% higher for 26 Dec and 1 January. The prices of teaching materials refers to 1 book per approximately 4 weeks. Students staying less than 4 weeks, can borrow copies at no cost. On the first Monday a level test takes place. If you have booked the intensive course with 20 lessons, you have 1 lesson on the first day with the normal programme commencing on the Tuesday. With the course of 28 lessons, you have 2 lessons the first day. There is an extra fee of € 26 for students who need a visa letter or letter of acceptance. To receive the documents by express mail, the supplement is € 45. For complete beginners, the school offers an intensive course of 2 to 4 weeks in which participants get to know the basics of the English language. Groups are smaller stand during standard intensive courses: with a maximum of 8 participants per class, teachers make sure each student gets the attention needed. After a course for beginners, you can participate in the other courses as well, which have a minimum level of A1. Our partner school St Giles in Eastbourne welcomes 14-17 year old students in spring and summer (see specific course dates). Students aged below 18 can choose for an intensive course of 28 lessons per week, with exclusively students from their own age. Juniors 14-17 years old are taught in separate classes of maximum 10 students. The fees for intensive courses for students aged 14-17 years include three social and leisure events per week, supervision and administration. You’ll stay with a host family on half board basis. The course is suitable for teenagers who already have some level of independence, because in the end, you will stay at an adult school, surrounded by people of all ages. In case you prefer even more security, guidance and groups activities, we recommend our junior courses in England. Accommodation in a host family for students aged 14-17 is including half board. In June/July/August junior students (under 16 years old) may be asked to share a room with another student of a different nationality of the same or a similar age. The Cambridge Exam preparation course in Eastbourne lasts either 8, 9, 10 or 12 weeks and consists of either 20 or 28 lessons per week. During the course you will be prepared to take the Cambridge Exam, the most widely accepted and well-known English as a foreign language qualification. The Cambridge exam course prepares for FCE and CAE only. The Cambridge exam courses might need an extra night of accommodation due to the exam dates. Price for extra night on request Prices do not include the exam fee and need to be paid to the school/on the spot. The TEC (Teachers of English Course) is a teacher development course for non-native teachers of English who want to update their teaching methodologies, as well as improve their English. The course consists of 26 lessons per week. Participants develop and explore aspects of teaching methodology and techniques, and learn to assess and utilise a variety of teaching aids and resources. At the end of the course, all participants receive a certificate of attendance and a St. Giles Teachers of English Course Certificate. These courses are designed to be very flexible, and can be adapted to suit the specific needs of the participants. We can also arrange closed group courses for groups of teachers travelling together at any time of year. Your level of English should be at least level B2 of the Common European Framework of Reference for Languages to take part. Individual tuition offers the most rapid, relevant and cost-effective form of language training. This course of 15 or 20 lessons a week will be adapted both to your linguistic skills and your personal and/or professional needs. If you choose the course with 15 lessons, you will have lessons in the afternoon, with the course of 20 lessons, lessons take place in the morning. The Thompson Homes Residence is open all year round and offers stylish self-catering single rooms with en-suite bathrooms. This residence is conveniently located just around the corner from the school and the seafront, and a short walk to the town centre. The residence has been recently refurbished and is tastefully decorated to a high standard. You’ll stay in a single room with en-suite bathroom on a self-catering basis. Wi-Fi is available as well. En-suite bathrooms have a shower, toilet and hand basin. Furthermore, there is a shared open plan living/kitchen area, including hob, oven, microwave, washing machine, dishwasher and fridge/freezer. Students aged between 14 and 17 years old can stay with a host family based on half board. Staying with a host family is the best way to improve your English in an informal setting. Host family accommodation in either a single or double room. The host families are situated around 25-30 minutes walking distance away from the school. In June/July/August under 16 years old may be asked to share a room with another student of a different nationality of the same or a similar age. The Bed & breakfast "Reymar" is a family-run quality guest house 30 metres from the seafront. It has been recently refurbished and is a 20-minute walk from St Giles Eastbourne. All rooms are en-suite and have free toiletries. There are tea and coffee making facilities and a TV in each room. WIFI access is available in communal areas. Full English breakfast is included in the price. There is also a guest lounge to relax in with DVDs and board games to borrow. Discount of 20% on a language course in Eastbourne, a lively and traditional English seaside town! Austria, Belarus, Belgium, Bulgaria, Croatia, Czechia, Denmark, Estonia, Finland, France, Georgia, Germany, Greece, Hungary Italy, Latvia, Lithuania, Monaco, Netherlands, Norway, Poland, Portugal, Romania, Slovakia, Sweden & Ukraine.